Sharp tools are prerequisites to do jobs and gaming is no exception. The award-winning Logitech G19 gaming keyboard gives you the tactical advantage over your rivals with industry-leading innovations and guaranteed Logitech quality. Logitech´s G series gaming keyboard was one of the first to incorporate a color LCD panel. This add-on provides unprecedented in-game information to speed up your decisions. You don´t have to worry if your game is not supported by the G19. Top titles are printed in the support list, including Age of Reckoning, Multiwinia, Crysis Warhead, Brothers in Arms: Hell’s Highway and World of Warcraft. More are on the horizon. So when you purchase the G19, you purchase the future. As top-notch gaming gear, the G19 boasts custom-color illuminated characters for easy locating of crucial command keys, yet not harsh to your eyes. The no-learning-curve 104-key layout is complemented with a mass of function keys, twelve of which are fully programmable. 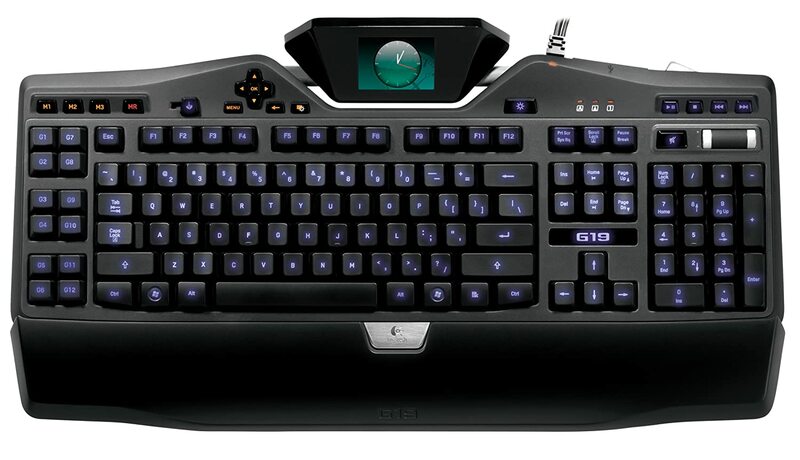 The twelve programmable G-keys positioned right under your left hand can be assigned to any keystroke on the keyboard or complex macro to execute attacks on your enemies. You can elaborately define G-key macros in G19 management software before the incoming campaign, or create a macro just in the middle of the battle and instantly launch it without pausing action. Focusing all on the gaming side improvements, the G19 is indeed a nuclear weapon in the hands of a serious gamer. It offers all the flexibility and power you could imagine, and the next question is: Are your skills qualified? Giving you an arsenal of advanced gaming technology, the Logitech G19 gaming keyboard is the first Logitech keyboard to feature a color GamePanel LCD. The tiltable, 320-by-240-pixel display provides valuable in-game information for over sixty games, including World of Warcraft (requires installation of included Logitech GamePanel software). In addition to in-game information, the screen can show VoIP communication data, clock, CPU load, or other non-gaming specific items such as pictures or videos. And you can easily switch among types of information – without ever leaving your game. If you take your gameplay seriously, you want the Logitech G19 on your side. Play with the best. (1) A tiltable, color GamePanel LCD displays game stats, system information, VOIP communication data, video playback, image slideshows, and many other items, without leaving the game. 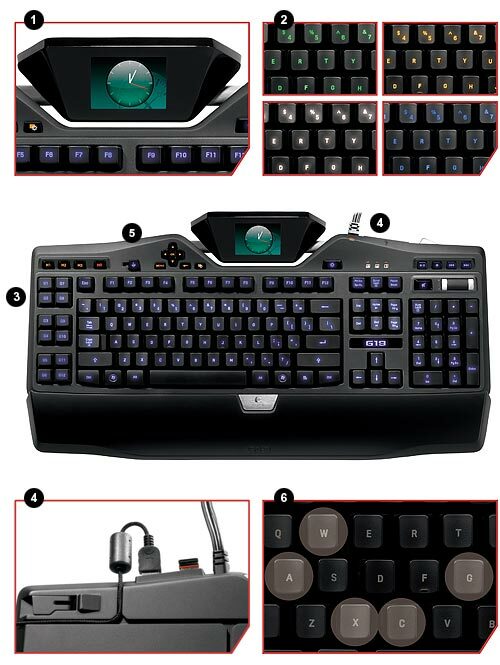 (2) Lets you personalize the keyboard to complement the rest of your computer and gaming equipment. (3) Provide space to program 36 time-saving commands per game (single keypresses or complex macros). The MR key allows you to record new macros on-the-fly. (4) You can connect and power devices – such as your G9x Laser Mouse or G35 Headset – with the two high-speed USB 2.0 ports. You also have the ability to transfer data to and from peripherals – like MP3 players and flash drives – while providing power to charge battery-powered devices. (5) A game/desktop mode switch lets you disable the Windows /Context Menu keys so you don’t get accidentally kicked out of your game. (6) Performing multiple actions simultaneously is also made easier with the keyboard’s multi-key input-functionality, which allows you to engage up to five keys at the same time.